When it comes to service engine light service, the sooner you bring your vehicle to USA Automotive in Raleigh, NC, the sooner you’ll experience worry-free driving. Not to be confused with the Check Engine Light (CEL), the Service Engine Light indicates that your vehicle may need maintenance. 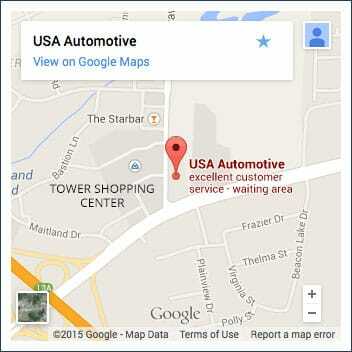 At USA Automotive, we can take care of any problem that we find with your vehicle. If your service engine light ever comes on, stop by our shop, or give us a call. Our team can provide all of these answers and repairs, usually in the same visit. Get Your Service Engine Light Fixed! As soon as your service engine light appears, it may trigger panic. However, there is usually nothing to worry about immediately. The service engine light may indicate something happening with your vehicle’s emissions system, or it could be the result of some other electrical issue. The only way to resolve the issue is to have a certified mechanic take a look. At USA Automotive, our team of ASE Certified techs that are more than happy to eliminate your service engine light concerns. Give us a call today to schedule your appointment. As an added convenience, we offer the opportunity to schedule your next service engine light appointment directly online! Simply use our online scheduling system to reserve a day and time that works best for your schedule! We look forward to serving you!